Most drivers would cover less than 500km a month, according to a survey from the AA. THE MAJORITY OF motorists would typically spend around €125 on petrol or diesel, according to a new survey from AA Car Insurance. The survey of 5,000 road users in Ireland found that 58.26% would spend up to that amount a month on fuel, with 18% spending between €50 and €75 and 16% spending between €75 and €100. 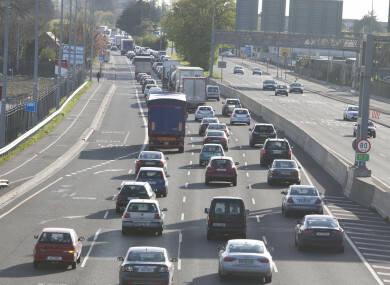 Around one in ten motorists, meanwhile, said that they’d spend up to €250 a month. Drivers were also asked how much distance they’d cover in a month, with almost half saying that they drove for less than 500km a month. A quarter said they drove between 250 and 500km a month, while one in five said they regularly drive less than 250km. On the other end of the spectrum, one in twelve said they would regularly drive over 2000km every month. AA’s director of consumer affairs Conor Faughnan said that fuel costs are one of the biggest issues faced by motorists in recent years. He said: “Whenever we see fuel prices rise the person who takes the brunt of the blame tends to me the shop-owner, but in reality over 60% of what motorists pay at the pump is made up of government taxes including so called ‘emergency taxes’ introduced during the recession. Instead of making the long overdue decision to at least partially remove these emergency era taxes government retained the status-quo and, as a result, little has been done to help ease the cost of commuting to work for those who rely on a car. In its monthly fuel prices update, the AA said a litre of petrol currently costs on average 134.9c while a litre of diesel costs 123.4c. Read: So, what’s the deal with Ireland naming and shaming drink drivers? Email “The average motorist in Ireland spends up to €125 a month on petrol”. Feedback on “The average motorist in Ireland spends up to €125 a month on petrol”.